Creativity techniques as applied to Requirements Engineering (RE) focus on finding novel and appropriate requirements, facilitating system and business innovation. However, ideas are generated in a free-form, manual fashion, with much guidance from human facilitators. Creative output is captured by analysts using text and informal diagrams, not amenable to (semi-) automated analysis, including decision support. 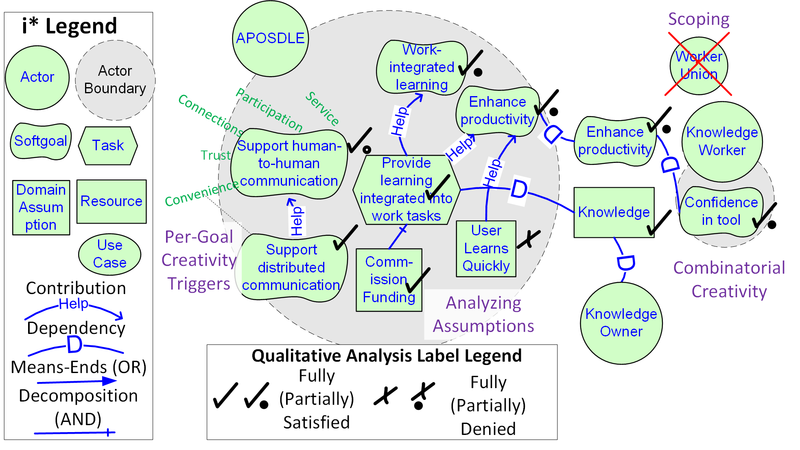 Goal modeling and analysis captures stakeholder goals and requirements, with underlying formalisms allowing for (semi-) automated analysis over alternative requirements. However, it is not always easy for stakeholders to articulate their goals, or to come up with creative alternatives. In this project we exploit the synergies between creativity techniques and goal modeling and analysis. Specifically, we use creativity techniques to populate goal models with creative content, and use the structure of goal models to facilitate exploratory, transformational, and combinatorial creativity. We focus on capturing project output as part of online, distributed, creative, model-based support tools. Creative Leaf Release Our web tool, Creative Leaf has been released. We welcome feedback! creativeleaf@city.ac.ukPlease see our instructions and tutorial videos in the navigation menu.